In Australia during the past few years, the condition known as Portal Shunt has been diagnosed in a very small number of cairns. The Cairn Terrier Club of Victoria has formed a Health Watch Committee to further research the problem and keep records of affected Cairns. I am fortunate to be the Chair Person of the Health Watch Committee and as such, offer help and support to anyone with a cairn who has a problem with this worrying disease. 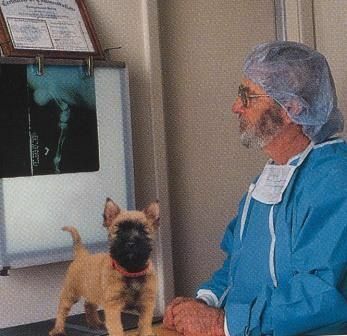 Lochrin Cairn Terriers is committed to a screening program for every litter, and this is done when the puppies are between 7-8 weeks of age. 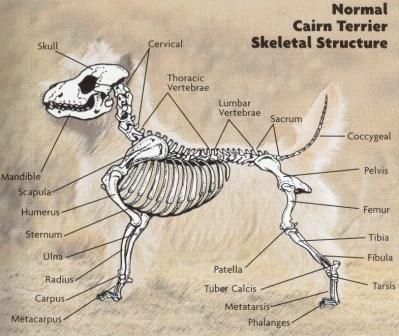 All testing is recorded on the Cairn Terrier Club of Victoria Data Base, and it is hoped that all responsible breeders will follow suit. Commonly known as Liver Shunt or PSS, it is a condition where the normal flow of blood to the liver is diverted, (or "shunted") by a "portal vein", and is therefore not cleansed and detoxified by the liver before returning to the heart and pumped to the rest of the body. A portosystemic shunt is therefore an extra blood vessel, which is an abnormality in the system, and consequently toxic substances enter the body directly. Puppies do not react well to anaesthesia, vaccinations and other drugs. Puppies are often underweight and small in stature, (but not always). Diarrhoea and/or vomiting regularly or occasionally. Lethargic or "drunken" behavior, particularly after food. Strange behavior such as head pressing, circling and/or disorientation. Excessive drinking and urinating. (Often urinary tract infection). Any of the above can be intermittent. (The dog is fine one day, but not the next). Worst cases include temporary blindness, seizures and even coma. What age are the symptoms first noticed? The two most common stages in the puppy's life that can alert the owner of a PSS problem can be firstly when the dog is spayed/neutered, because the liver cannot metabolize the anesthetic/sedative agents to help eliminate them from the system. Secondly, when puppies have grown older and are eating more high protein food, especially when changed to being fed a larger quantity, less frequently. Some puppies have shown signs of the disease by 6 months but others, not until much older. Herein lies the biggest challenge to Cairn Breeders today. Reports from Europe, USA and UK Universities, where test matings and research have been undertaken, believe that the disease is hereditary. They also believe that the genes involved are recessive, therefore needing two "carrier" parents to produce an affected puppy. However, these genes are also plygenic, so because "groups" of genes are involved the mode of inheritance, at this stage, remains unknown. Although unknown at present, it would be unwise to repeat a mating which resulted in an affected puppy. The search for a DNA marker continues overseas, but is unlikely to offer an answer in the immediate future. Surgery is effective in 85% of cases. Nowadays the Shunt is not closed off entirely, and a method has been devised which involves allowing a small amount of blood to pass through, therefore not causing pressure to the liver. This surgery, however is very expensive, but many dogs have gone on to live normal, happy lives after it. The prognosis for dogs managed by diet and medication is not as successful. A low protein diet must be strictly adhered to and close veterinary monitoring maintained. A dog managed this way may expect a lifespan of only 3-4 years. What preventative steps are being taken? Lochrin Cairn Terriers have all litters tested by means of a "Bile Acid Test" which may be done when pups are 7-8 weeks of age. It should be noted that this test is an effective screening tool only. It does not give a definite diagnosis, but rather an indication that further testing should be undertaken. A young dog with high bile acid results would be considered highly suspicious. This page is dedicated to Rosie, who taught us all.